Everyone must have heard that the climate change would have a huge impact on the lives of the people but the people never know when such conditions would erupt, we have heard a lot about increase in cyclones, gradual rise of sea waters and countless other climatic condition that could devastate our lives, so If the current reports by scientists are to be trusted then it is quite evident that the sea level is rising and they continue to threaten the world especially the coastal communities. The sea level is rising but the rate is much slow than previously expected and it varies from region to region. Sea level rising – Beware of the gushing waters! Globally water level have risen by 3mm per year but this does not mean that people need to calm down because there has been a huge variation in this scenario for instance the Philippine Sea is rising at the rate of 10 mm per year with some part reaching 12 mm per year. Sea level near lower southern Japan is also rising at 12 mm per year while other parts of the sea level near the country has shown a drop of – 3 mm to – 4 mm per year which is quite astonishing. Arabian sea and Bay of Bengal rising as well? Most part of the Arabian sea that touches the Pakistani and Indian coast have shown an increase of 3 mm per year but sadly the Indian Gulf of Khambat has shown a rise of 6 mm per year while some parts of sea near Oman have also risen. The condition is similar in Bay of Bengal as well but a decrease in sea level over central Bay of Bengal has been observed as well. Overall the sea level is rising slowly in North Indian ocean excluding small areas where a decrease has been observed. Frequency of tropical cyclones – Beware of the roaring waters! Cyclone Phyan: A memory for Mumbaikers! Arabian sea is usually considered dull when compared with its arch enemy the Bay of Bengal, which is also a part of the north Indian ocean. Bay of Bengal is famous for its small but destructive cyclones that usually take the lives of more than 500 people in either Burma, Bangladesh or eastern India. The world’s most deadliest cyclone also formed in the Bay of Bengal that was the Bhola cyclone that struck East Pakistan present day Bangladesh in 1971. Depression from Bay of Bengal are vital for monsoon advancement but since past few years there has been slight decrease in these depression while a steady increase in the tropical activity in the Arabian sea. In 2000, 6 in the Bay of Bengal – Nil in the Arabian sea. In 2001, 2 in the Bay of Bengal – 3 in the Arabian sea. In 2002, 6 in the Bay of Bengal – 1 in the Arabian sea. In 2003, 4 in the Bay of Bengal – 1 in the Arabian sea. In 2004, 5 in the Bay of Bengal – 5 in the Arabian sea. In 2005, 12 in the Bay of Bengal – 2 in the Arabian sea. In 2006, 11 in the Bay of Bengal – 2 in the Arabian sea. In 2007, 8 in the Bay of Bengal – 3 in the Arabian sea. In 2008, 8 in the Bay of Bengal – 2 in the Arabian sea. In 2009, 5 in the Bay of Bengal – 3 in the Arabian sea. In 2010, 6 in the Bay of Bengal – 2 in the Arabian sea. 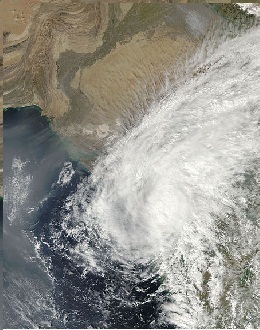 In 2011, 5 in the Bay of Bengal – 4 in the Arabian sea. Bright chance of cyclones hitting mega cities! Tropical cyclones that form over the Arabian Sea have a high chance of making landfall as the stretch of sea is relatively small as compared to Atlantic hurricanes and Pacific typhoons. Depending on track there are bright chances that future cyclones can directly strike mega metropolis cities like Mumbai and Karachi that could kill thousands of people and may change the way these cities used to live. ← Search for Truth – West takes the hottest place from East! @ K.M, Coastal Cyclones? The reality is different. Coastal cities like Karachi gets very less rainfall and No Precipitation over Karachi and Arabian side while those cities which have not sea like Islamabad and Lahore and NEW DELHI are getting cyclones kinds of rains many times each year. Yes but Karachi does not represent whole Arabian sea, there are other coastal cities too that has as much importance as Karachi. @KM When will you post a review article of monsoon mentioning amount of rain different cities got in this monsoon? I did add monsoon rains for Karachi, Islamabad, Lahore and Hyderabad on ‘monsoon of pak’ page.